20 winners from 5 countries across Europe were selected by an international jury of senior agency and client representatives chaired by Josep Hernandez, Senior Director of Communications Planning at Mondelez International. There were 9 winners from the United Kingdom, 7 from Germany, 2 from Denmark, and one each for Spain and France. Grey scooped Agency of the Year with entries from P & G, McCormick, Deichmann, United Biscuits and Bolia.com, achieving a high first round average score and further success with 3 Gold Effies (FMCG and 2 in Small Budget), 4 Silver Effies (Brand Experience, Consumer Goods, Long-term Effectiveness and Product/Service Launch) and 2 Bronze Effies (FMCG and Retail). The agency was also rewarded with €100,000-worth of free advertising spots from Euro Effies partner, Euronews. The prestigious Grand Effie for outstanding work was presented to DDB Berlin GmbH and Deutsche Telekom for their campaign “Travel & Surf.” Through their humorous mockumentary, “Wi-Fi Dogs,” they changed roaming behavior and grew their user base. Delivering the message of “Look for the fun. Not for the Wi-Fi,” the campaign relaxed phone users who live in fear of a big bill when travelling. 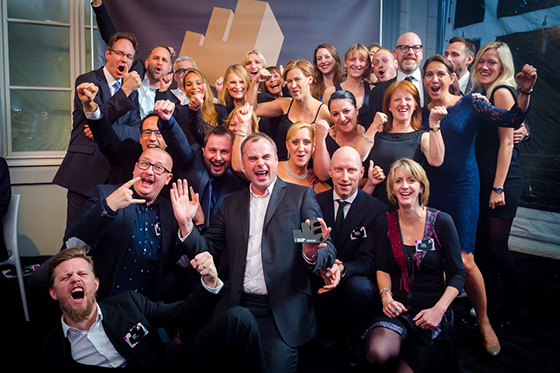 The Euro Effies Awards are produced in partnership with Euronews and supported by the European Publishers’ Council, FEPE, Procter & Gamble, AdForum, WARC, Viva Xpress Logistics, Nielsen, Bacardi-Martini and creativebrief.